From the most serious of foodies to the most casual of diners, you’re in for a treat when you visit Orlando as it has a vast range of delicious options to satisfy every taste and budget…all we really suggest is that wherever you decide to go you turn up hungry! We have gone through and chosen Orlando Ticket Deals’ best in class dining experiences and recommend that you fit in a few of these joints on your next visit to Orlando. BurgerFi prides itself in picking up where the other “better franchises leave off” and focuses on all-natural free-range beef which is not only better for you, but it tastes amazing! What should I order? Go for the classic cheeseburger it is a two-patty sandwich with American cheese, lettuce and tomato. It's a juicy combo with the chain's signature branded bun on top. The bread is fresh and slightly sweet, akin to a Hawaiian roll. Team it with a milkshake for the full American experience. Keke’s is a franchise born in Orlando which is quickly getting a reputation not just for their great tasting pancakes but for the sheer size…one is certainly big enough. This café is reliably good – driven by a clean design and a very welcoming atmosphere – definitely worth a try for the pancake lovers out there! What should I order? Create your very own pancake combo . Made for your unique pancake tastes…what’s not to love? Manny’s Chop House is an American Steak House which boasts an outstanding quality of meat with all steaks cooked to total perfection…guaranteed! This restaurant is extremely popular and you can’t book, but the good news is they have an excellent bar if you do have a bit of a wait. What should I order? Steak, Steak and more steak! Oh and salad on the side…it’s prepared for you at your table and is simply delicious. Chef Mickey's is a buffet style restaurant which serves up great breakfast flavours—and you’re favourite Disney Characters! 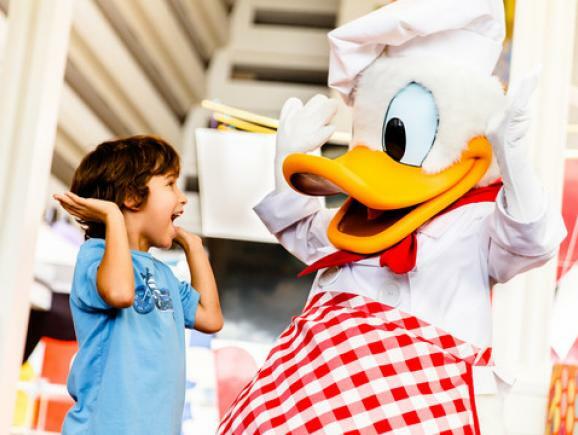 Your whole brood will chow down with smiles across their faces, while the likes of Mickey or any assortment of his pals roam around the restaurant. What should the kids have? Mickey Waffles! Disney’s enchanting Beauty and the Beast themed restaurant nestled at the foot of the Beast’s Castle. TOP TIP: With Disney’s FastPass+ you can now reserve restaurants from 180 days in advance before you even travel! Raglan Road is an Irish pub which offers its own unique twists and celtic creativity along with yummy Irish food! Master Chef Kevin Dundon (one of Ireland’s best loved chefs) crafts all the food from classics such as shepherd’s pie to more innovative delights inspired by the Emerald Isle. What should I order? Stick to a classic dish – I can recommend the fish and chips. Step inside the famous Diagon Alley pub at Universal Studios and fill up on traditional British food and of course, you can enjoy a delicious frothy Butterbeer. What should I order? Go for the hearty bangers and mash…you will be transported back to Britain! 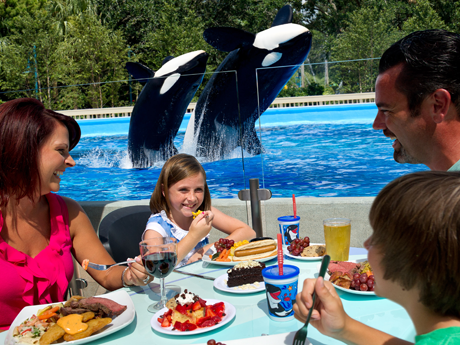 Dine with Shamu is said to be Orlando’s most immersive dining experience, as you be able to get closer than ever to the majestic whales whilst enjoying a delicious menu. What should I order? It’s an all you can eat buffet – so my recommendation is to try a little of everything! Victoria & Albert's restaurant in Disney's Grand Floridian Resort & Spa offers a unique dinner menu each night of exceptional, contemporary American cuisine served with unparalleled charm and elegance. A 13-year recipient of the prestigious AAA Five Diamond award, this Signature Dining restaurant serves fine cuisine with wine pairings from an award-winning cellar. What should I order? Order anything you want it will all be outstanding! However, my suggestion is to let your guard down – don’t play it safe and make sure you pick things you wouldn’t normally go for. The Cheesecake Factory is a famous American restaurant which is known for its generous portions and remarkable flavours that are ideal for sharing or indeed for taking home. With over 200 menu selections made from scratch everyday (including cheesecakes) there will be something for everyone...and it's not bad value either. Receive a FREE Kids Eat Free Card for every child in your party when you spend over £450 on your tickets with us. For more information about booking your Orlando tickets visit Orlando Ticket Deals to see our great range of prices for all the top Orlando theme parks and attractions.